Animals aren't pre-emptively fleeing the Yellowstone supervolcano earthquake stampede. 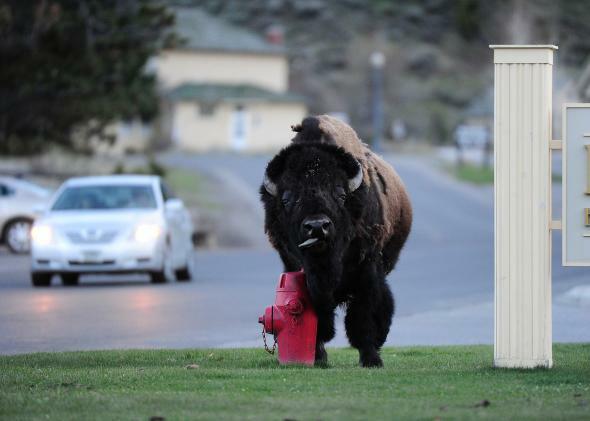 Completely unaware of any latent seismic activity in the area, this Yellowstone bison is rubbing against a hydrant to slough off molting fur. Last weekend there was a 4.8 magnitude earthquake in Yellowstone—the biggest earthquake in the park since 1980. However, it did not cause charismatic megafauna to flee en masse or generally run for their lives. Viral videos showing some bison apparently making a hasty retreat are, as in so many cases, misleading. First of all, it’s a myth that animals have a Spidey sense for oncoming earthquakes. There is evidence that seconds before an earthquake, animals begin feeling a type of wave that humans can’t, and they may begin to react. But beyond that, it doesn’t seem like animals have any type of day’s notice. Second of all, even if they did, there is no evidence that they would know the optimal way to react (such as running away from the epicenter of the earthquake). According to a video released by Yellowstone (below) the bison take the paved roads around Yellowstone to look for food toward the end of long winters—like this year’s. “It was a spring-like day and they were frisky. Contrary to online reports, it’s a natural occurrence and not the end of the world,” a park spokesperson told Reuters. Stop trying to make earthquake-sensing animals a thing, Internet.